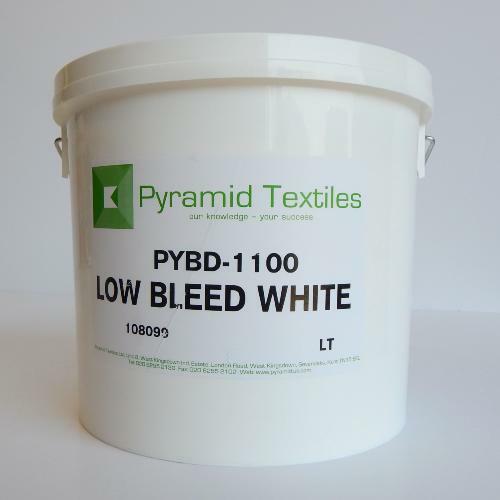 Pyramid Low Bleed White is designed for maximum smoothness and opacity on poly/cotton fabrics. It is opaque, with excellent matting characteristics and a creamy consistency. This low-bleed ink is designed to use on both manual and automatic presses. Pyramid Low Bleed is s fast flashing, allowing for shorter dwell times and faster production rates. It works well for highlights or as a stand alone white. Designed to be printed through mesh counts ranging from a 34T - 77T a firm squeegee will cut through this ink and deposit a nice smooth layer, with good resistance to the potential problem of bleeding.